I am remiss in not following up and posting the details on my design for the Prius fresh water tank. I didn't have the details while on the road do I just got the question affairs so it reminded me that I need to post the details. 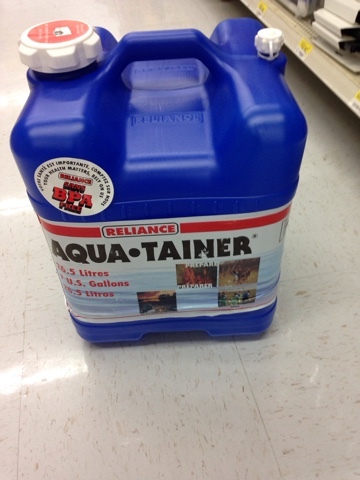 The following picture of the Aqua-Tainer is what I used during my 2015 Prius Travels. This water tank didn't work for me in a few ways. 1. It was too tall so it was difficult to design storage around. 2. I had to move my bed around to get to the top to access to fill and draft water. 3. The thought I would take it out and use on picnic tables wasn't something I did or was going to do with Boodocking and Disbursed camping. A case of you see your travels one way and it turns out different. 4. I had to tilt the tank to have s passenger in the front seat as it was tall and swayback would hit it. I'm an engineer and design solutions to my problems. 1. I didn't need 7 gallons. 6 is fine for how I live on the road. I can live on a gallon a day and I go in town for any number of things every few days. 2. I wanted a lower center of gravity. 3. I wanted access without moving my bed. 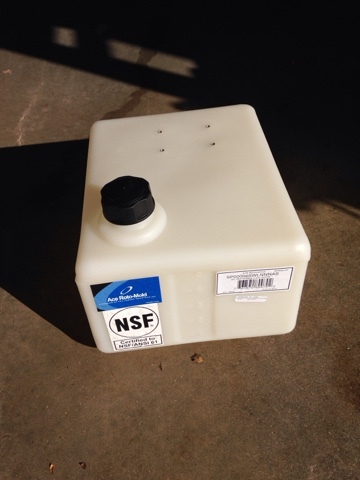 It took a bit of research to find a 6 gallon water tank that would sit as I wanted it to on the rear passenger side floor, with the front seat back to accommodate a front passenger. It is available from other suppliers too. To my surprise the pump mounting holes on top of the water tank worked great for my top mounted storage unit. This was not planned, so it was a pleasant surprise. 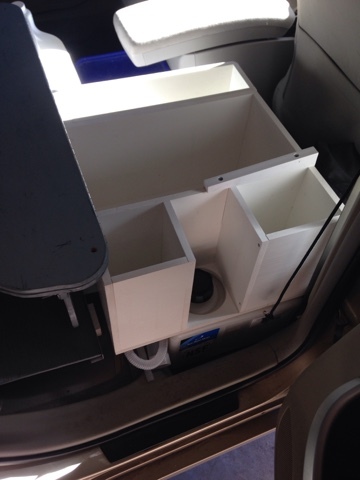 My storage box design accommodated a cutout for accessing the water tank fill cap. You can see in the above picture the hand pump hose I chose sticking out on side of tank. I bought this pump off of Amazon. Here is the link to the page of hand aquarium pumps. 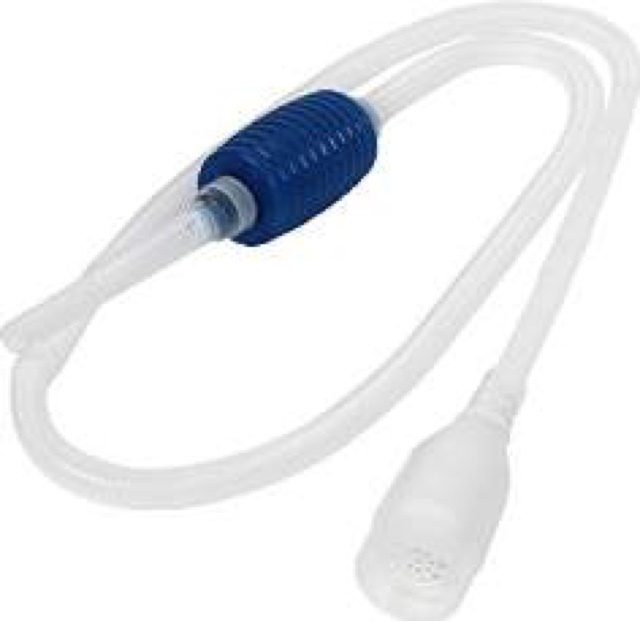 The aquarium pumps use food grade plastic so the tank and pump are good for drinking water. Once you draft water and you have your container below the height of the water gravity takes over. Hope this helps fill in the blanks on my water design. Brent thank you for posting this. I am thinking of adding a permanently mounted water tank. I typically would fill it with water bought by the gallon from those water machines. 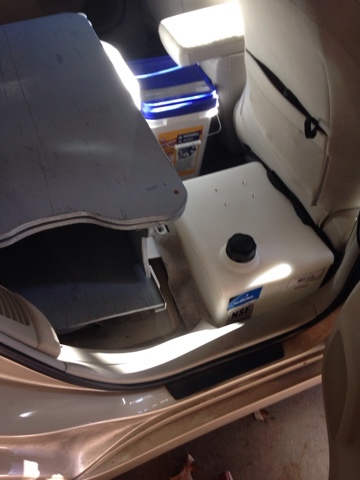 Being able to tuck the water underneath a shelf increases my usable space in the minivan. I do like my new water tank and hand squeeze fish tank pump to get the water out. If you buy this model you need to be able to open the cover and pour the water in. I have a funnel to increase the ease of doing it. There are 4 mounting holes on top for a small electric pump if this helps get the water out where you need it. There are complanies that offer bolt through the tank fittings if you would like a remote fill. Yet there are companies that sell standard and custom sizes of tanks and will put fittings where you want them. For me the simplicity of this tank and how it set exactly in the rear foot well made it easy to not have to get too elaborate. Best wishes on your water tank design. Have you found occasion to clean the tank yet? Was curious what your process was for that? I love this idea. I'm married with 2 kids so traveling long term in the prius won't work but my wife and I often like to road trip for hiking trips and are considering a prius as a daily driver that doubles as a 'couples' camper.